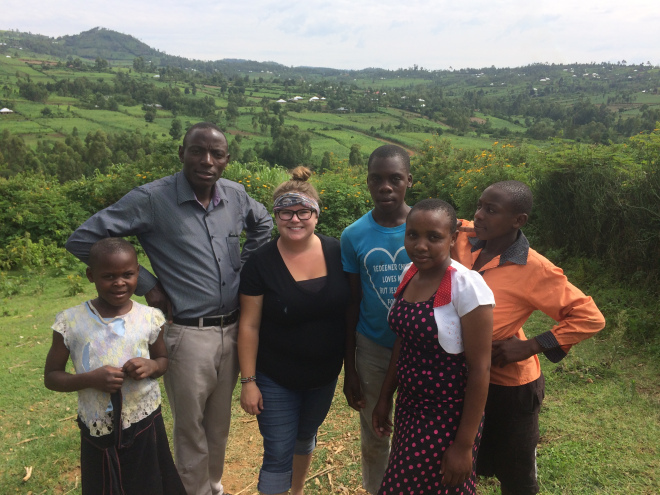 To continue our series on missional living, today, we are featuring Redeemer’s very own Kayde Hays who has just hit her one month mark of her three month internship in Kenya. Today we will be sharing the latest post from her own blog called Keeping up with Kayde in Kenya. So enjoy hearing a heartfelt update from a joy-infused young woman braving a foreign mission field with overflowing love and growing faith. During a conference in 2009 I heard a song titled Hakuna Mungu Kama Wewe. I fell in love with it! I couldn’t wait for the next time they would play it. I am pretty sure God was preparing me for something there because that song is Kiswahili which means “there is no God like you”. Thank you Lord for these sweet reminders that you are always faithful and you have a plan for me. I have reached just over a month in Kenya, time has seriously flown by. Ruth, Joy, Stuart, and I did a road trip one weekend and we were able to visit all the homes from KAK. Wow.Wow.Wow.Wow.Wow. This was certainly a highlight! Mitaboni is based in Machakos which is about 3-4 hours east of Nairobi. Benjamin & Lillian lead this home & they are doing outstanding! This home is located in the middle of a community in which they are very involved with, I love seeing homes work with the communities that surround them & vice versa.We were only able to visit for a few hours, but that was so special. They provided us with lunch & sang us songs. Asante Sana! The view right outside their rooms, so beautiful! Lillian, KD, & Benjamin – how much they love God is so encouraging. Nyamarambe is about 6 hours westish from Nairobi. This drive was very long, but the scenery on the way was so worth it! Kisii county is known for their tea fields, there was so much tea! It rains there frequently so this helps their very lush landscape. We spent 2 nights there, asante sana Benson & team for being so hospitable. This home is the smallest home KAK has. It is very intimate & they are truly a family. My favorite part was doing devotions with them. Benson is a great pastor & the kids sing so well. Bwana Asifiwe! Some of us walking down to the river- see how green it is! I added this photo because Mike laughed sooo much when he saw it! This crew & I had lots of fun, obviously! Last week a team from the U.K arrived & it was so much fun. We found that even though we all speak english, sometimes it’s easier for us to understand Kiswahili than each other! It was so fun fighting over the “right” sayings/spellings of words. I am thankful they let me be apart of their team. It was awesome (they even made fun of me for that word!) having devotions & doing a Bible Club with the kids. We did the Lord’s Prayer over the course of 3 days. They also invited me to go to Samburu (located in Northern Kenya where Safaris are commonly located) with them… that was a lot of fun. Alex with his heart creation for our freeze frame. Love this guy! My safari tour guide, haha just kidding! Stuart & I needed a picture with our matching tourist hats. The rooms we stayed in. Our Safari vehicle! The cool one. Haha. Thankful for Charles & his knowledge of the animals! Lastly, we celebrated Kids Alive 100 years! This was an amazing celebration that brought staff, friends, alumni, kids, etc together to celebrate and thank God for His Faithfulness. It was seriously so much fun to be with all of them. This was also a farewell to Ruth. She has been here for 9 years & has made such great relationships with the staff, kids, & community. She will be greatly missed, but we are excited to see where God uses her in the U.K.
Ruth & her son, Anomat. Wonderful people! Isacc & I during the celebration. He is a wonderul man of God & his love for this ministry is so contagious! James & I at the celebration. James grew up in the home and is the deputy (discipline teacher) at Hall Mead with Kids Alive. He’s teaching me Swahili! haha. For Ruth as she is adjusting to being back in the U.K.
For myself as I am now the only person in the near distance where english is my first language, but also praise that I have made great friends with the adults here at Karundas. Thank you all so much for your messages, love, support for me. It really means a lot and is so appreciated/needed. I thank God for you guys. Love you all. Stay up-to-date on everything going on with Kayde in Kenya through her blog Keeping Up With Kayde in Kenya. Lets remember to pray for Kayde, that God would use her willing heart in powerful ways, equipping her beyond anything she ever imagined she was capable of, as He continues to restore and transform her heart, mind, and soul. And if would like to know more about Kids Alive Kenya and Redeemer’s history with this organization, pick up your copy of Amani Magazine at the church office or in the Welcome Center on Sundays. All proceeds from these magazine sales go directly to support the children of Kids Alive Kenya. Also, if you found yourself wondering what some of the Swahili words Kayde used in her post meant, there is a fun Swahili page of common words and phrases translated into English in the Magazine. Check it out!